The transverse abdominal (TA) muscle is the deepest of the 6 abdominal muscles. It extends between the ribs and the hips, wrapping around the trunk from front to back. The fibers of this muscle run horizontally, just like a back support belt might be worn. In this way, along with providing postural support, the transverse abdominal muscle helps to contain and support the organs located inside the trunk. The transverse abdominal muscle originates in several places. It interdigitates with your diaphragm muscle, which is the principal muscle of breathing, and it attaches to the inside surface of your lower six ribs. In back, it connects to the thoracolumbar fascia. In front, the transverse abdominal muscle connects to the front part of the inside of the hip bone (on its inner surface) as well as the lateral (lateral means towards the outside) 1/3 part of the inguinal ligament. The inguinal ligament is a thin strap of connective tissue that extends from the front of the hip bone and attaches onto the pubic symphysis joint. The transverse abdominal muscle inserts onto the xiphoid process, which is a small bone that hangs down from the bottom of your breastbone, the linea alba, which is a tendon that runs vertically from ribs to the pelvis and separates the right and left sides of the superficial rectus abdominus muscle, and the pubic symphysis joint. By flattening the abdominal wall, the transverse abdominal muscle provides stability to the trunk and support for the organs located there. The transverse abdominal muscle may also assist with exhalation by compression the abdominal organs and increasing pressure in the lungs. As mentioned above, in the front, the transverse abdominal muscle attaches to the linea alba. The linea alba tends to lose its strength during pregnancy. Strengthening the transverse abdominal muscle after the baby is born may be a good way to restore integrity to the linea alba. Also, when the linea alba is weak, lordosis is increased. One of the things that made Pilates a unique system of exercises is the attention paid to the transverse abdominal muscle, especially its capacity to flatten the abdomen and stabilize the trunk. You can get a feeling for how this muscle works if you cough or laugh, paying attention to the abdominal area of your trunk as you do. While Pilates was perhaps the first exercise method to emphasize engaging and using the TA for core stability, in recent decades the notion has caught on. Nowadays, most personal trainers, physical therapists and exercise systems place at least some attention on working the deep abdominal muscles, which, of course, includes the transverse. In fact, much research has been done, and many methods for engaging the TA muscle, as well as the other core muscles, have developed in the last few decades. 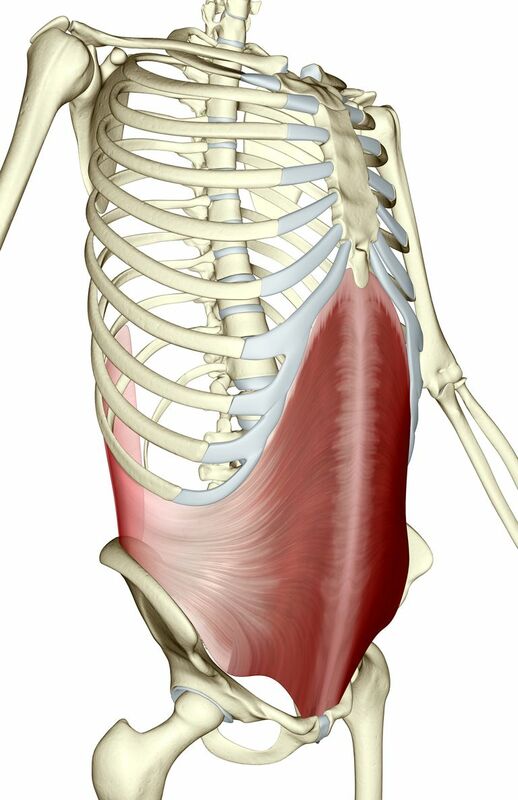 The transverse abdominal muscle is one of many muscles comprising the core. But if you ask 10 therapists or personal trainers what exactly the core is, you'll get 10 different answers. Diane Lee, a physiotherapist from Canada who specializes in the core defines it as the area of the body that's located between the diaphragm muscle and the pelvic floor. According to Lee's definition, the core includes all the joints in the pelvis, lumbar spine and chest. This means that core muscles are not limited to the TA, obliques and rectus abdominal muscles; instead, the core encompasses many other trunk muscles. That said, the transverse abdominal muscle, along with the diaphragm, pelvic floor and a lumbar muscle called the multifidus are key players for good posture and movement and for keeping the back pain away. Lee says that these muscles prepare you for movement and that they are thought of as "anticipatory." To that end, she takes an awareness approach when working with her patients. That is, before giving patients a conventional core strengthening program she works with them on finding and activating these very deep muscles. Otherwise, she explains, the patient will think they're exercising their TA when in reality the exercises will be dominated by more superficial muscles. Kendall, Florence Peterson, McCreary, Elizabeth Kendall, and Provance, Patricia Geise. Muscles Testing and Function with Posture and Pain. 3rd. Baltimore, Maryland: Williams & Wilkins, 1983. Lee, D., Core training vs strengthening - What is the difference and why it matters. Diane Lee & Associates Physiotherapy.